Are you needing a Big Obstacle Course Rental for a large event? Crazy Monkey has got exactly what you need! Our 100 ft Mega Obstacle Course can accommodate your mega sized group. This outstanding rental is nothing like you’ve ever seen before! Our Mega Course is the ultimate inflatable obstacle course with many different elements to keep your guests on their toes. We have lots of different courses to choose from 30 feet up to 180 feet long. They will be crawling, climbing, running, bouncing, dodging, sliding and for sure, laughing. 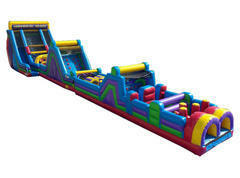 This Big Obstacle Course Rental is perfect for corporate, church, and school events. Not only is it an absolute blast to play on but can also be used for team building skills. And don’t forget a little competitiveness. We will bring out 2 generators with this rental. Don’t forget to check out our concessions rentals, shaved ice is the perfect way to cool everybody down. Crazy Monkey provides party equipment delivery service throughout the greater Erie Pennsylvania area, and it's surrounding communities like Fairview, Girard, Waterford, McKean, Edinboro, Harborcreek, Northeast, and Cambridge Springs. Contact us here!